Here is a great deal from one of our favorite places! Tea Collection is having an amazing sale for 2 days only! Nothing better than spreading love to friends and family, and that is just what Tea Collection is doing! 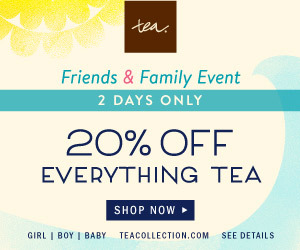 For just two days only (4/22 and 4/23) you can receive 20% off everything on Tea Collection during their Friends & Family Sale. Take advantage of the sale and pick up twirly dresses, colorful Tees and sweet baby items for summer. Also check out Tea’s new sporty selection of swimsuits for your little water bug. Feel free to tell your friends and family, because there is always enough Tea Collection love to go around.